Twenty years after the Battle of Hogwarts, in which Voldemort is finally permanently defeated, Harry works at the Ministry of Magic and has three children with his wife, Ginny. Their youngest, Albus, is just heading to Hogwarts and worries that he'll end up in Slytherin. Well, he does, and he befriends housemate Scorpius Malfoy - son of Draco - much to his father's chagrin. But despite what Harry wants to believe, it is Albus who is the bad influence in this pair. When he overhears elderly Amos Diggory lamenting the long-ago death of his son Cedric in the Triwizard Tournament, Albus decides to get hold of a Time-Turner and go back and prevent Cedric's death. As you might expect in any story involving going back in time to change things, nothing goes as planned and everyone is in terrible danger. 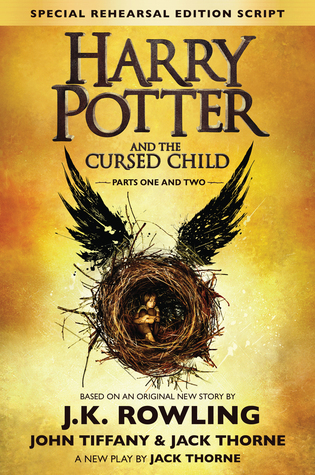 Unlike all of the Harry Potter novels, this new installment is actually a play. 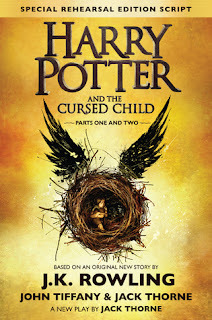 It's not even written by J.K. Rowling, though it's based on a story she came up with. I don't know if it was originally intended to be released in print - the show opened in London in 2016 and will be finally coming to the US in 2018 - or it was public demand that drove the decision, but either way it was super popular when it was first released. I had no intention of reading it, since I don't like reading plays. But then I read Raisin in the Sun and realized that plays can be just as wonderful as novels so I immediately grabbed a copy from the library. It felt new and familiar at the same time. We met the main characters as adults at the end of Deathly Hallows, which I found odd at the time but which ultimately helped to provide a smooth transition into the time period of the play. It was quite fun to see how their lives turned out, and - once Albus started mucking with the Time-Turner - how they could have turned out. There is more to the story, too. There is some connection to Voldemort that causes Harry's scar to hurt for the first time since Voldemort was defeated, and it turns out there's a person who is connected to him on the scene now. This adds lots of tension and danger to the story, and the whole plot was intensely satisfying. Harry's relationship with Albus is strained. His other kids were sorted into Gryffindor as expected, and are everything he wants in kids. But Albus is different and Harry is a total jerk to him for it. He's not a bad kid! Slytherins don't have to be bad! But Harry is just as stupid as he always was and refuses to see it. Albus can also be somewhat of a bonehead, so the two aren't actually as different as they think. Scorpius, on the other hand, is actually a lot like Hermione. He's smart, curious, and an all-around good kid, but is plagued by dark rumors that he was actually Voldemort's son. Poor kid doesn't deserve it. I really liked him a lot! I'm very glad that I read this so soon after finishing the series on audio so I remembered a lot of the past events and characters that were referred to. It was a quick read since it was a play and didn't involve all the description of a novel, but although there were fewer words it still felt complete. It was very enjoyable!